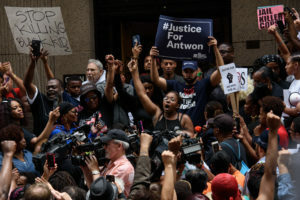 PITTSBURGH — Video that showed a white police officer fatally shooting an unarmed black teenager was played for jurors as the former police officer’s criminal homicide trial got underway. A neighbor who recorded the confrontation said the tone of Rosfeld’s voice is what got her attention. “That type of tone frightened me myself. It was an angry tone. He was mad at something or someone,” Lashaun Livingston told jurors as testimony began Tuesday. Her letter was released Wednesday ahead of the trial’s second day. In it, she asks prosecutors to paint a picture of her son as he truly was.